I can honestly tell you that my life has been forever changed! And the question is, what was the pivotal point in my life? Did I win the lottery? No! Do I have the best of everything? No! Am I in the best shape of my life? No! It was none of these. It was merely the fact that I learned the value of human relations. 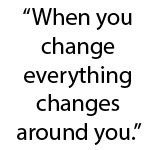 When I decided to change everything negative about myself and towards people, everything changed in my life. I mean every aspect of my life. And I wouldn’t trade everything I learned, or what I am now applying to myself and others for anything in the world. Life is truly grand for me right now. It has given me such an attitude of gratitude and wonderful doors of opportunity have opened up for me as well. You see, I struggled with a negative mindset for many years. It nearly tormented me. I had so many fears that it would literally stop me from reaching even simple goals that I would set for myself. I just couldn’t break this horrible negative mindset. I just didn’t know how. It wasn’t until I got so tired of drowning in my misery that I had to reach out and get help. The first thing I did was to allow a great friend that I trusted to mentor me. This was the beginning of my quest for happiness. I then began to read many books on personal development. Like, Dale Carnegie, Norman Vincent Peale, DanI Johnson, Jim Rohn, Napoleon Hill, The Bible. These are just a few of many books that I devoured. They were truly life changing for me. I then began to go to many seminars that would inspire me to move out of my comfort zone, and reach the goals that I had set for myself. This whole process took about three years of intense searching for true purpose in my life. I was so desperate to change my wrong thinking pattern, that I became very consistent and intentional every day to not only keep a positive mindset, but to also speak positive words to myself. This is where the healing began. It was in the daily process. This is when I began to feel the empowerment of who I was becoming. I began to see people in a whole new perspective. It was like coming out of water and seeing life in a much more beautiful way. When I realized how much personal development impacted my life, that’s when I decided to become a Certified Life Coach. I want to help as many people as I can remove any obstacles that get in the way and prevent them from reaching their full potential. I never realized that I would be passionate about serving people through my pain. But, I sure don’t mind, it’s all worth it and it brings much satisfaction to see others free from emotional set backs. Think Good thoughts Towards People. Here are key points that catapulted me to a rich fulfilling life. Our hearts must always desire to cooperate with people and be others oriented. There absolutely cannot be any other motive in our hearts, but only to seek the best in others. It’s not to say that we won’t come against friction with people, even when you have good intentions. But, to seek out the good in the other person and try your best to see the situation from their point of view is the way to help them. Your perspective will change with that person and you will react differently. Life can become so complicated when we want people to see everything according to how we think and feel. But that is not a life of true happiness. It’s when we truly grasp that our mindset has to change in regards to how we view life and people from their perspective and try to understand them. 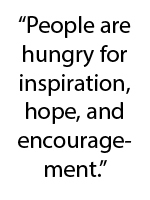 People are hungry for inspiration, hope, and encouragement. Every human being was created for a purpose and everyone has a unique gift and calling to serve in the capacity of their innate strengths. In other words, everyone has value. Now don’t get me wrong, everyone has choices that determine their destiny. But that doesn’t take away the gifts and purpose we are born with. In order to make this world a better place, we must bring out the best in people, whether it’s a compliment, or acknowledging their gifts, or encouragement. Dale Carnegie says we praise dogs more than we do humans. So true! My intention every day, whether in my home, work, or organization is to be in harmony with others at every opportunity. This is possible if you set your intentions every day and apply them. Then it becomes a good habit. This new way of thinking towards people has truly changed my life for the better. As soon as I started taking interest in other people, and truly cared about them, their attitude also changed towards me. My relationships have truly been enriched and it is truly a joy. I never knew life would become so rich when we always think goodwill towards others. It hasn’t always been that way for me. I used to get offended easily, then become bitter and refuse to cooperate with them. I didn’t realize that it would hinder my own happiness by thinking negatively towards others. Do unto others as you would have them do unto you. This is a great biblical principle that I took hold of and make every effort to apply everyday. If you smile at someone, he most likely will smile back. If you strike someone, the chances are he will strike you back. If you express kindness, you are almost certain to receive kindness in return. If you are critical of everything and everyone, you can expect to receive critical judgment from others. The greatest gifts you can give don’t even cost. I know that time is most meaningful to my daughters. We always spend time together in the evenings and talk about our day, or goals etc. I know that we will not forget these precious times and money can’t buy that. Remember when your life is all said and done, what will people say about you? Trust me, I’ve been to too many funerals and they will not talk about the fancy car you drove. It will always be about the impact you had on others. Be a giver of good, and it will always come back to you. This is a foundational principle. Always help others succeed in small or big ways. I know for a fact that I have been truly blessed to have learned many principles on personal development and now that I have applied them, my life is truly rich in many ways. I am now on a mission to help as many people as I can succeed. One particular client of mine came to me. She was seventy five years old and retired but there wasn’t much excitement in her life. I asked if she still had her health? She said yes! I asked her if she still had energy? She said yes! Then I told her she still had a purpose to fulfill. We talked about her passions. She started getting really excited about her life again. She got her license as a notary. She also got really involved in the community. She also lost fifty pounds. She is back living a rich life. She is also one of my dearest friends. This is one of the commitments I made to myself. As I continue to move forward in my life, I will always help others along the way. I used to be deathly afraid of taking any risk at all. I thought if I stayed in my sweet little comfort zone, I would feel safe. Little did I know, it kept me from setting goals, dreaming, and living my true purpose. Staying in my comfort zone spelled misery for me. There was no excitement in my life at all. Once I got my confidence, I decided to go after my passion. I didn’t quite know what that looked like yet, but I kept attempting new endeavors. I thought it was opening up a new salon, but soon realized that, that wasn’t it. Then I attempted to go to different salons to create workshops on personal development and customer service. I wasn’t too sure about that either. I then started thinking about starting a women’s networking group in our town. I began talking to people about how to start one. In addition, a few of us women got together and created our first meeting. Women Inspired Network was established in 2012. It has been a great success thus far. Our mission is to build relationships, inspire, network, encourage women to be in service to one another, and the community. We have been giving back to the community through the luncheons that we create every other month. We continue to grow stronger. It has been an incredible journey. I’m so thankful that I never gave up, because if I had, I would never have met these amazing women along the way. What I recommend is that you keep taking risks until you find the right fit for your purpose. In addition, I also founded Inspired Futures, which assists young adults ranging from sixteen- twenty four discover their strengths and passions. I also help them remove any obstacles that would interfere with reaching there enormous potential. I also partnered with Career Ladders- Anita Rodasavich. She provides them with a blue print for their career development. At last, I am fulfilling my true passion in life, which is to inspire people to be all they were created to be.